While the NBA finals are in full swing and the two best teams are battling it out for the ultimate prize, another 28 are now in summer vacation. In order to achieve their goal of still playing this time next year, teams often look to improve their roster through trades, player development, and most importantly, the NBA draft. Through the draft, savvy teams can drastically improve their results by selecting potential franchise players, players that fill a given need, or that fit team chemistry. Since 1994, the NBA has used a weighted lottery system in which teams with the worst regular-season record are conferred a higher probability of obtaining the first pick (more details here). More recently, the 2014 draft has attracted some attention because of its depth (some well-respected scouts and analysts have projected up to five potential franchise players in there!). The interest was further increased when the Cleveland Cavaliers won the first pick for the third time in four years and with only 1.7% probability of winning it. While we cannot deny their luck, it also got me thinking about which franchise has had the most luck in the draft from 1994 to now. For this, I used a Python script to scrape draft data from the Real GM website. First, we can look at the number of times each team was part of the NBA draft lottery, and their average draft position between 1994 and 2014. In the past twenty years, the LA Clippers, Golden State Warriors, Toronto Raptors, Washington Wizards and Minnessota Timberwolves have participated in the lottery the most often. It is interesting to notice that of these five teams, only the Minnesota Timberwolves were not part of the playoffs this season. Amazingly, the San Antonio Spurs have only been in the lottery once since 1994, which was in 1997 when they landed the first pick and Tim Duncan (who 17 years later, is still active and playing a leading role in this year’s Finals!). For each of the teams shown here, we can also count the number of times each team received the first pick in the draft, or one in the top 3. Here, the Chicago Bulls, LA Clippers and Philadelphia Sixers have accumulated the most top 3 picks in the past twenty years. However, the Cleveland Cavaliers have received by far the most first picks in the lottery. While informative, the figure above is not normalized for the number of times each team has been in the lottery, and also doesn’t show the number of positions gained or lost during each lottery. 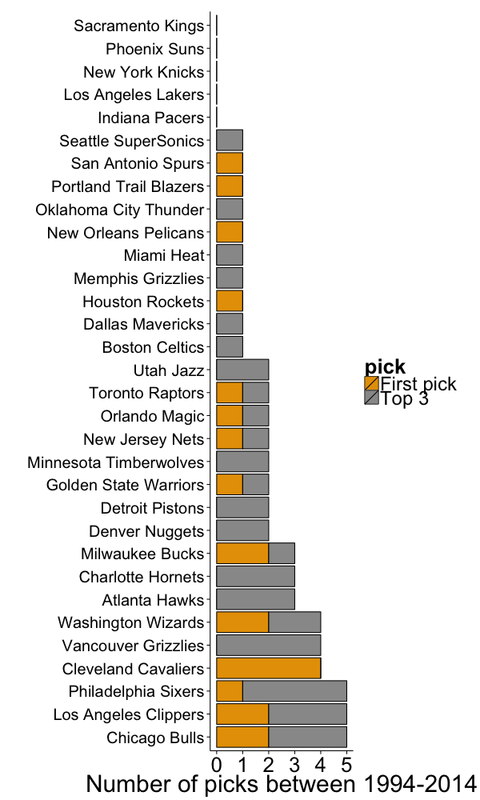 To do this, we can look at the luck of each team by comparing its expected pick against where it actually ended up after the lottery order was selected. 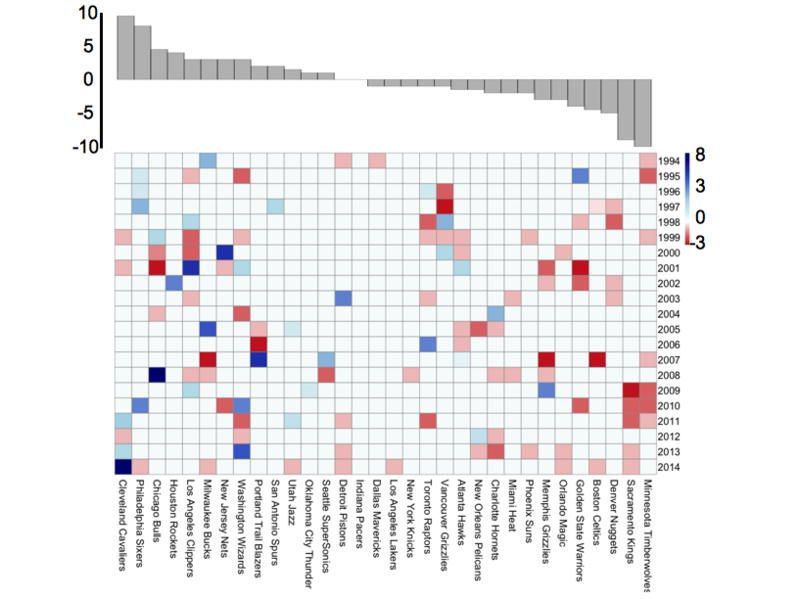 The heatmap above shows the change in position for each team in the lottery between 1994 and 2014. Blue cells indicate that a team gained positions during the lottery draw, red cells indicate that a team lost positions during the lottery, and white cells means that there were no change in position or that the team was not part of the lottery. Overall, the Cleveland Cavaliers, Philadelphia Sixers and Chicago Bulls have been the three luckiest teams in the draft. The two biggest gains in lottery position occured in 2014 (Cleveland Cavaliers) and 2007 (Chicago Bulls), when both teams jumped from position 9 to number 1 (with 0.017 probability). On the flipside, the Minnessota Timberwolves and Sacramento Kings have been the unluckiest franchises since the NBA draft started a weighted lottery system. Next, I intend to extend this analysis by exploring which NBA team has the best scouting track record. In other words, I will look at the total contribution that each player brought to the team that drafted them.